Mark Duncan at Yachting Partners International sends word that Gregory Gheraia has sold his central listing, Benetti’s 29.75m motor yacht Salve, to a direct client. 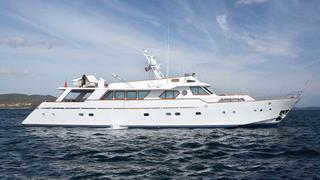 Built in 1974, she was returned to her original excellent condition during a year-long refit in 2007/2008. Working with a crew of five, she is RINA classed and MCA compliant, accommodates up to 10 guests comfortably and cruises at a stately 13 knots. Salve was asking €1.75 million.